In August 2018, Azamara Club Cruises expanded its fleet with the addition of Azamara Pursuit. The 702-passenger cruise ship fits nicely into the cruise line's commitment to destination immersion, as its smaller size allows it to get into ports that larger ships can't access. Beautifully renovated ship that offers intimate spaces and lively atmosphere. Most cabins, especially the bathrooms, are small and feel tight. Perfectly sized to sail into more remote ports; the shore experience is integrated onboard. While the ship isn't new -- it has a long history dating to its debut under the defunct Renaissance Cruises -- it has been painstakingly refurbished so that most spaces feel modern and elegant. A neutral color scheme serves as the ship's backdrop, which is punctuated with natural stone surfaces and rich, dark-wood detailing. 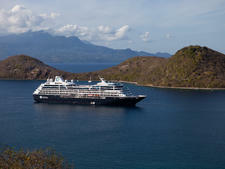 Azamara Pursuit is delightfully refined yet comfortable. The new heartbeat of the ship is The Den, a large, central space located on Deck 5 that is decorated in dark woods and light carpeting and has numerous bookshelves lined with travel guides. It also includes a large bar, making it a spot passengers can lounge in night or day. This space replaces what had been a casino on other incarnations of the ship. Other highlights onboard include an enticing pool deck, two specialty restaurants (a steakhouse and an Italian venue), and a spa and large fitness complex. Pursuit includes two spectacular Spa Suites, located adjacent to the spa. These come with large soaking tubs that have unobstructed ocean views. 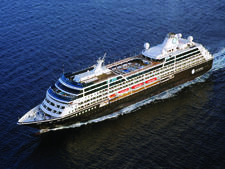 Azamara Pursuit passengers tend to be well-traveled and looking for new destinations to explore. The average age is mid to high 50s, and families are rare, as itineraries are longer and there are no dedicated spaces for children. You'll see more families on summer and holiday cruises. Expect older couples, with a strong contingent of North American passengers, plus other English-speakers from places like the U.K. and Australia. English is the language onboard; all announcements are made in English. Cruise Critic’s professional photographers and our extraordinary community members have taken 707 pictures of Azamara Pursuit. When you visit our photo galleries, you can be assured that what you see is what you get. By day, casualwear is the norm. You'll spend many days in port, so layers and comfortable walking shoes are a must. Poolside, passengers wear bathing suits, shorts, T-shirts and sundresses. At night, the dress code is resort casual. Men wear slacks and collared shirts, while women choose dresses, blouses, slacks, capris or skirts. Azamara Pursuit hosts a white party once per cruise, so pack your whites -- you'll fit right in. Your cruise fare on Azamara Pursuit includes your cabin, dining in the ship's main and buffet restaurants; a short list of spirits, beer, wine, bottled water, soft drinks, specialty coffee and tea; gratuities; self-service laundry facilities; and shuttle service in port. Fares also include an AzAmazing Evening event on most voyages. You'll pay extra for premium spirits and wines, shore excursions, internet, specialty dining and spa services.